My photo file is growing these days, mostly with white kitchens, since we are in the late planning stages of a kitchen remodel that I am 50% excited about. I'm not sure what's up with my other 50%, but part of me is just, like, huh. But that's another post. 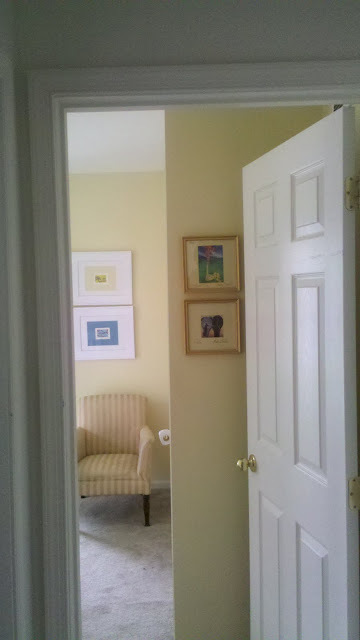 I am also going to commit to taking photographs of my own house in 2011. Slowly. I took the below photo with the best intentions of photographing my daughter's room, but this requires making her bed and staging and whatnot, so I got as far as her door and stopped. Her room is one of my favorites in the house. I will take photos of it soon. And I have to say I am struck by how much the safety cover on her closet door knob looks like a random roll of toilet paper. Also struck by how nice the carpet looks in the photo, when there are days I want to rip it out with my teeth (we need new carpet upstairs). Must organize and straighten house.